Published By – Essex Music International Ltd. Illustrated gatefold cover with lyrics inside, black label with silver print. Track A2.2 is not listed on either sleeve or centre label. This 'hidden track' does not appear on the 1969 US Mercury version of the release David Bowie - Man Of Words/Man Of Music. On the labels this version lists all publishing to Essex Publishing. See David Bowie - David Bowie for edition that lists 7 tracks to Control. This first UK pressing has an incredible punch to it - the UK stuff made in the late 60's and early 70's was out of this world. I can turn the volume on my copy up to stupid levels and still hear absolute clarity of all the instruments. 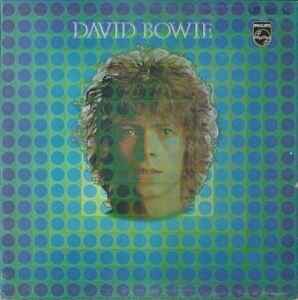 This LP and my UK dress copy of The Man Who Sold The World are two of my best sounding LPs. You certainly get what you pay for with this pressing - quality! I have an acquaintance who haphazardly came to own a copy of this version, but there's a special story to it. The release (SBL 7912 (852 146 BY)) is clearly mentioned on a makeshift sleeve, but it does not mention "Don't sit down". The lp is said to have been a present of one of the '69 sound engineers to his then-girlfriend. It came into posession of my acquaintance via via, without practically ever having been played. Does anyone have any more info on this version? Or an idea of what such a version would be worth? There are 2 versions of this edition - one is with "thin" Philips logo on labels and the second is with "bold" Philips logo on labels. Which one is earlier - have no idea. Hi guys, I'd like to own a LP copy of Space Oddity, just for my listening pleasure. Should I go for an early edition or the recent remaster?